Do you ever just wonder where the time went? That has honestly been the question I have been asking myself pretty regularly for the last 4 years (or should I just say since my daughter was born!) Despite my delay of posting a blog (sorry about that, by the way), I have been cooking up a storm over here… including all of my favorite oldies, as well as trying some new things. 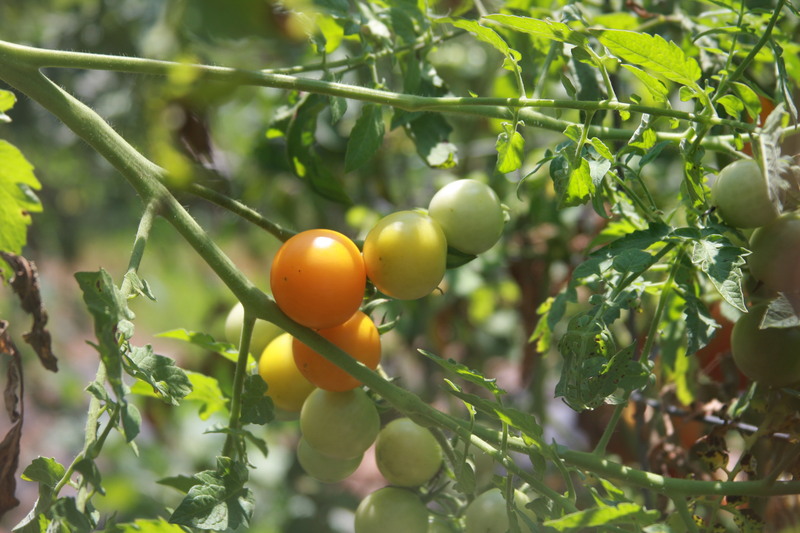 As you can see, we have our fill (and then some) of tomatoes over here! 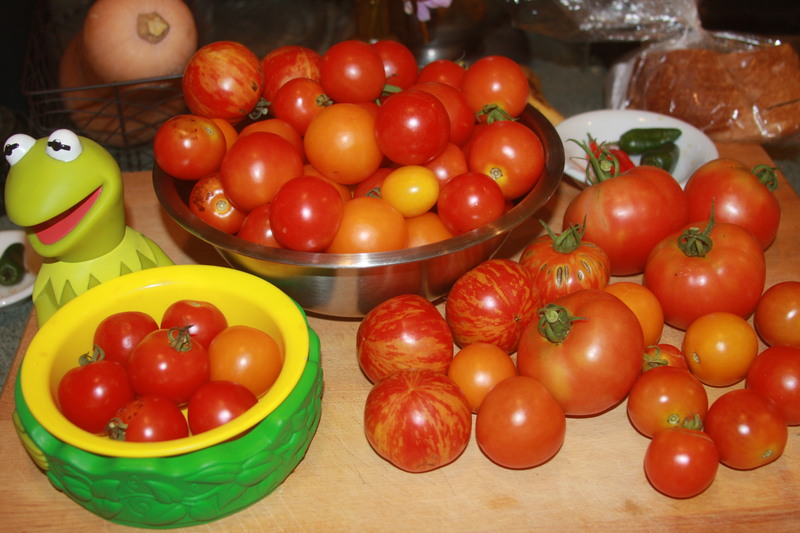 Our garden is absolutely exploding with tomatoes! The last time I told you about my garden, we had a serious abundance of cucumbers… Well, i didn’t really know too many ways to eat them all! We were literally picking off about 8 cucumbers a day on average for a while there! We ended up eating a lot on salads… snacking on tortillas filled with diced cucumber/tofutti cream cheese (which is even better with a little salsa, says my 2 1/2 year old)… and we juiced the rest that we got to before they went too rubbery. I really found that apple/cucumber juice (give or take a carrot or two) is really delicious! As is watermelon/cucumber/apple juice. I meant to pickle some of our cucumbers, but I wanted to invest in a good canning set-up instead of using the quick-jar method using a pickling pack. I also had a recipe for a cold cucumber soup that I wanted to try (that also contained coconut milk, which I LOOOVE), but honestly, I’m just not really a fan of cold soup and I didn’t ever get around to making it… But alas, now it seems that our cucumber plants are dying. Next year I may just keep it at 2-3 plants. 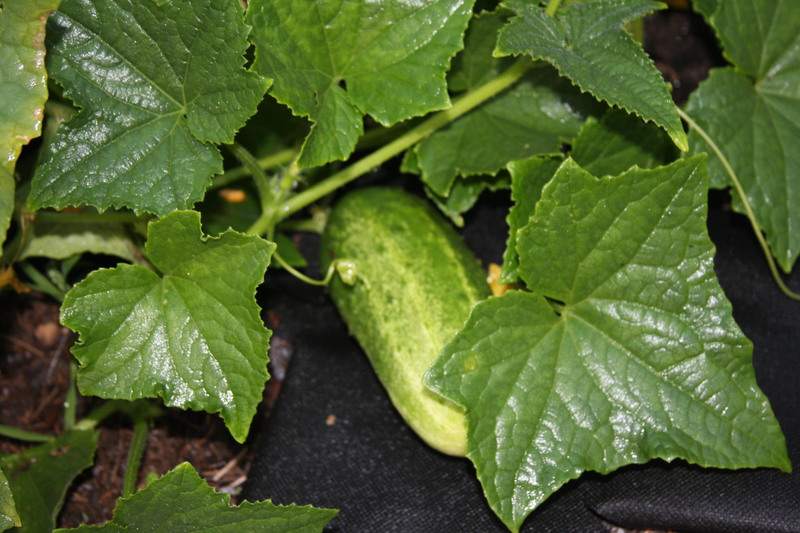 6 plants just produced too many cucumbers for us to consume at once! So… tomato sauce!! 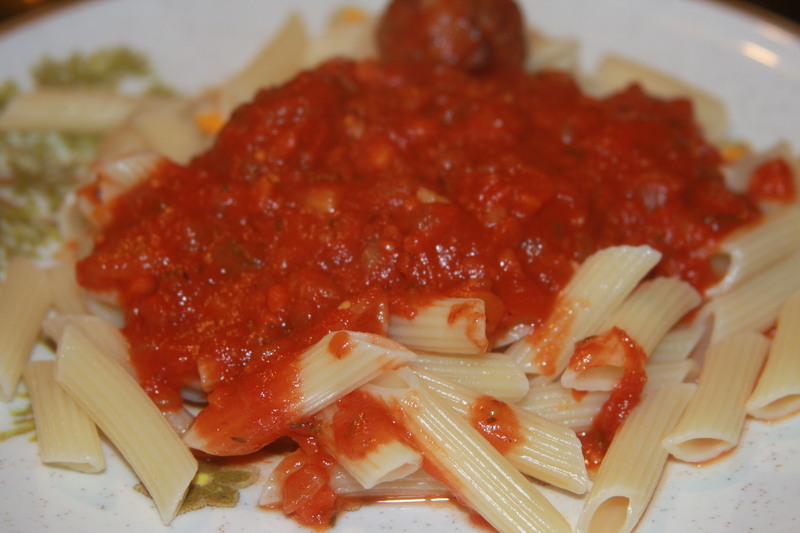 This is my basic pasta sauce recipe. It’s easy, its quick, it freezes beautifully and its a GREAT way to use up extra veggies and (of coarse) tomatoes. If you have fresh herbs, feel free to substitute them for the dry (if doing so, use a little more than the dry amounts). And feel free to add extra tomatoes, spices or veggies of your choice! I find that making tomato sauce is a bit of an art… You can follow a recipe, but I find its best just to taste it occasionally and add what you think it needs more of 🙂 That being said, this is a great recipe to eat as is… but sometimes it changes slightly depending on what veggies are sitting in our fridge. Sometimes I even stir in a pack or two of faux beef crumbles if we’re in the mood for a “meaty” sauce. 1) Saute together everything but the tomatoes (and sugar) until the onion is tender. 2) Mix in the tomatoes and sugar. Simmer 15-30 minutes, to let the flavors blend, stirring occasionally. 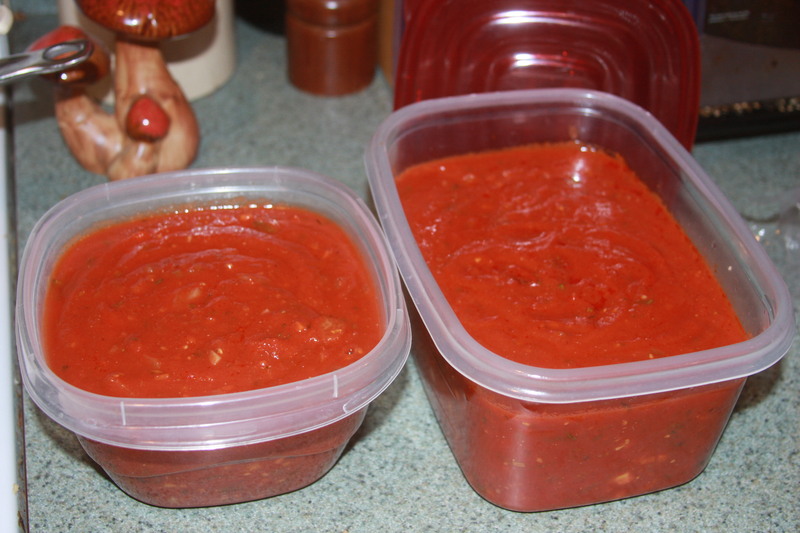 This is roughly the amount of sauce the recipe makes. The big one went into the freezer, and the small one served 4 plates with leftovers! 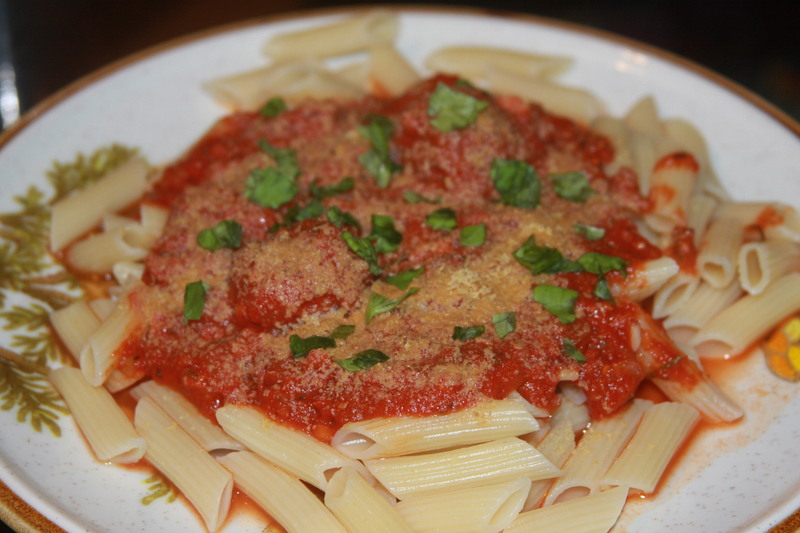 If you missed my faux meatball recipe, check it out here! I plan on experimenting with another meatball recipe soon! 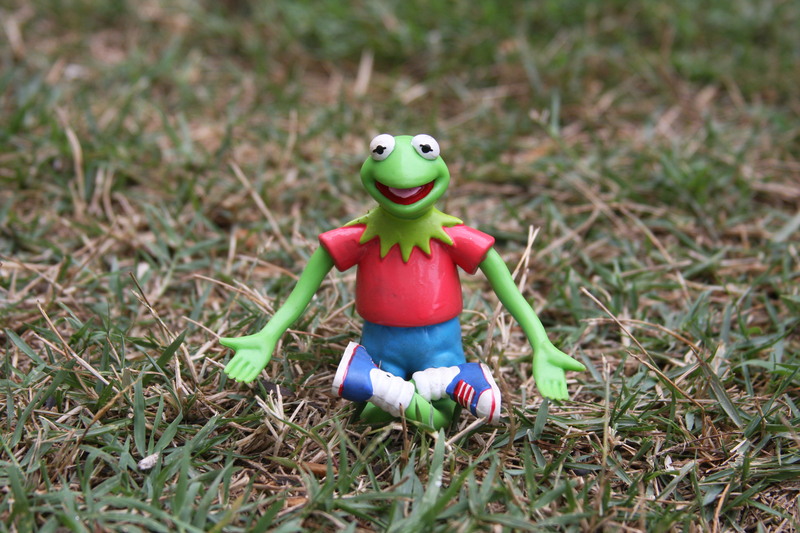 Summertime… and the livin’ is easy.. at least that is what they say, right?! 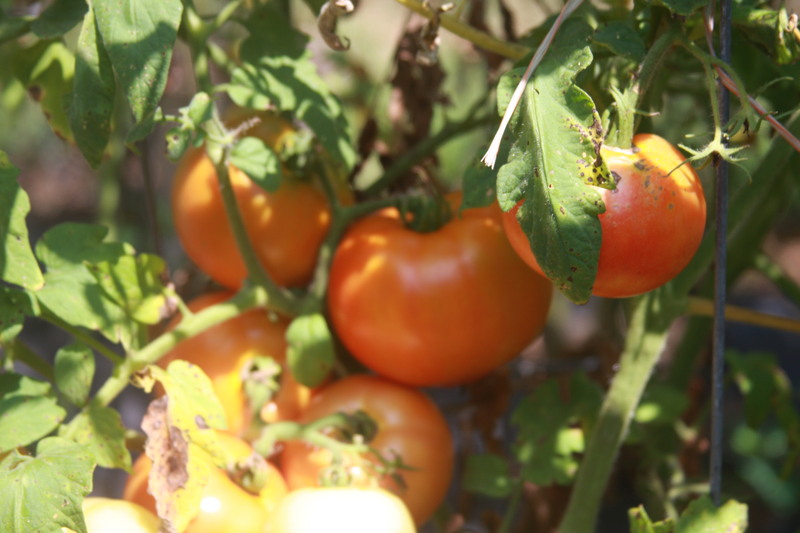 Well, having a garden or yard that’s producing fresh vegetables & fruit sure make living seem easier! There is nothing quite like being able to go out to the garden and get some fresh vegetables when they are needed! Something that always makes me think of summer is fruit. 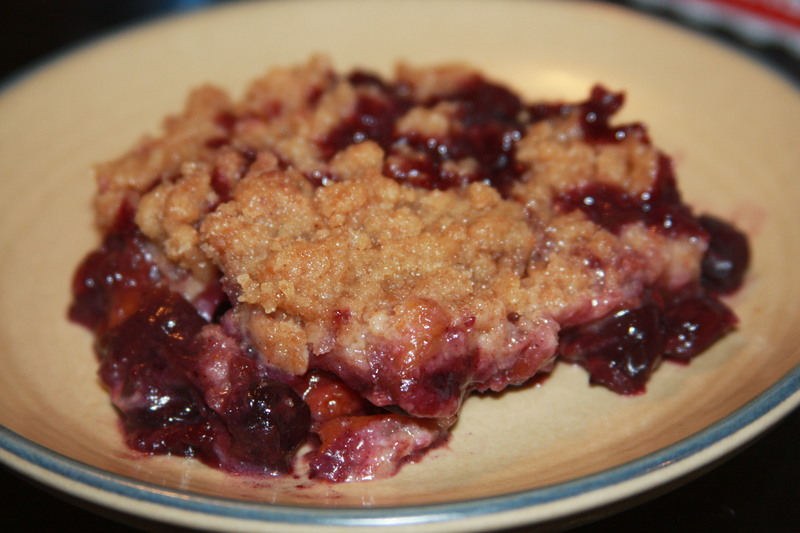 Fresh fruit… grilled fruit… fruit cobblers… apple, peach, blueberry, strawberry-rhubarb pies… mmmm I just love anything to do with fruit! There is absolutely nothing like being able to pick fresh fruit right off the tree or bush and eat it. We currently have 2 peach trees, a fig tree and 3 blueberry bushes. We had a small pear tree last year but it got some weird disease and we had to pull it up. If you are a mommy, this recipe is one that the kids will definitely have fun helping with. 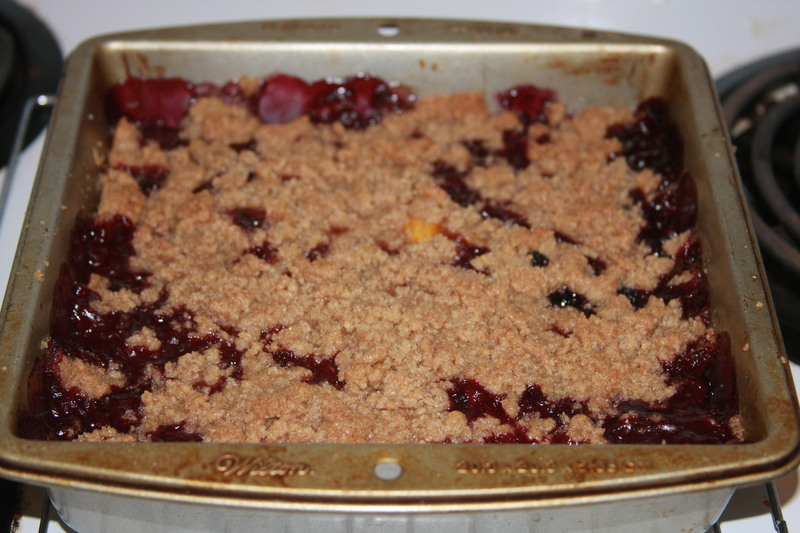 They can pour in the fruit and help crumble the topping over the top, which practically makes it for you! This is such an easy and delicious recipe it is one that everyone should have on-hand because anyone can make it, and like I said, it’s easy and delicious! I decided to try using spelt flour this time (usually I use unbleached flour) and it turned out beautifully! It’s good to know this quick dessert is tasty using spelt flour for those times when you need to whip up something quick for an unexpected gluten-free guest**(see note). 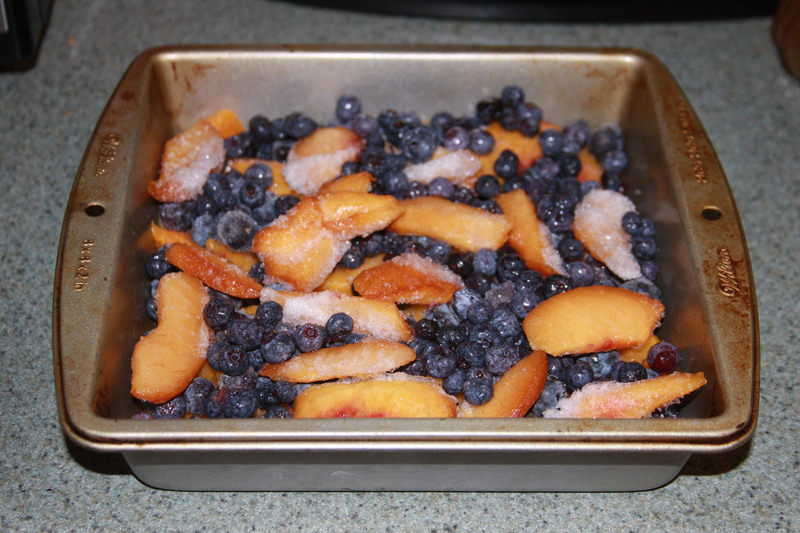 As long as you have some frozen fruit in the freezer (which we always do, since we are big smoothie makers over here) you should be able to throw this in the oven by the time it preheats. ** NOTE: Spelt flour is practically wheat free, which makes it a good substitute for people with a low intolerance for wheat, though some people with serious wheat allergies, such as those with celiac disease, are also allergic to spelt. In that case, you should try replacing the flour with a 100% gluten-free baking mix (most grocery stores carry a blend for general flour replacing). Please check if you are making these for someone who is gluten-free. If using fresh fruit, wash and cut any fruit you like and sprinkle it with lemon juice. 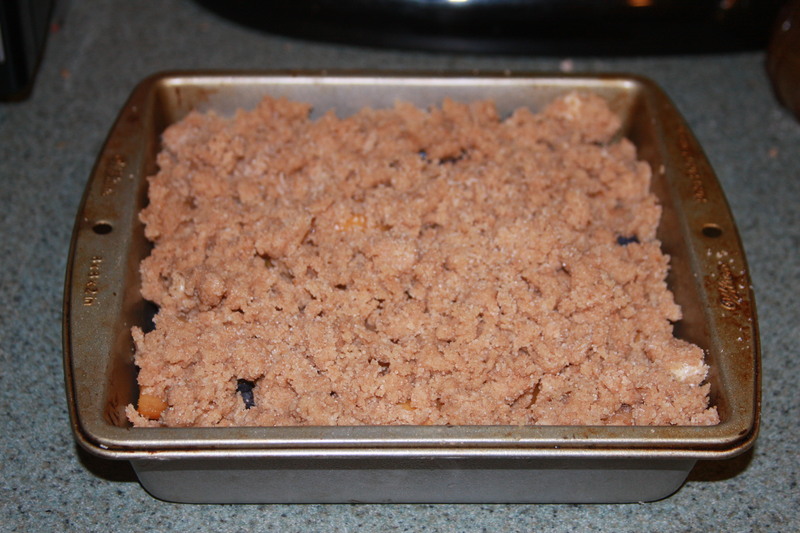 Frozen fruit works great (no need for lemon juice) and that is usually what I use. Some good combinations I like are peach/blueberry or apple/pear. 2) Combine the flour, sugar and salt. Using a knife, cut 1 stick ( = 1/2 cup) of cold soy margarine into bits and add it to the flour mixture, crumbling with fingers or fork until thoroughly mixed. We grew these peaches in our backyard! After baking, let it cool at least 5 minutes! Well, I decided that it’s about time I should show you all my garden I keep talking about so you know I’m not just making it up! It does really exist! We kinda got a late start to our garden this year because we missed out on planting the early leafy greens, like spinach, kale, and even carrots… but I should be able to grow those easily as late summer/fall crops. This is our 4th year of having a garden in this plot so our soil has become really nice and rich. And of coarse, I need to thank my husband for all his hard work including all of the tilling and row-making! This year we decided to try laying down this nice breathable weed guard that was given to us by my in-laws (thank you again!!) and it has worked out BEAUTIFULLY and saved me god knows HOW much time from having to weed the garden! Definitely worth the small amount of extra effort! The water absorbs right through the cloth and into the ground after several minutes. It has done a fantastic job so far! I have it weighed down to stay in place by using empty juice jugs filled with water and potted plants. Summer Garden : heirloom tomatoes, jalapenos, cucumber, green pepper, chili peppers, eggplant, collards and okra… and mint, cilantro and basil also. I live in Georgia, and what I find grows abundantly with little effort (aka all you have to do is water it) is cucumbers, okra, figs (tree) and blueberries. 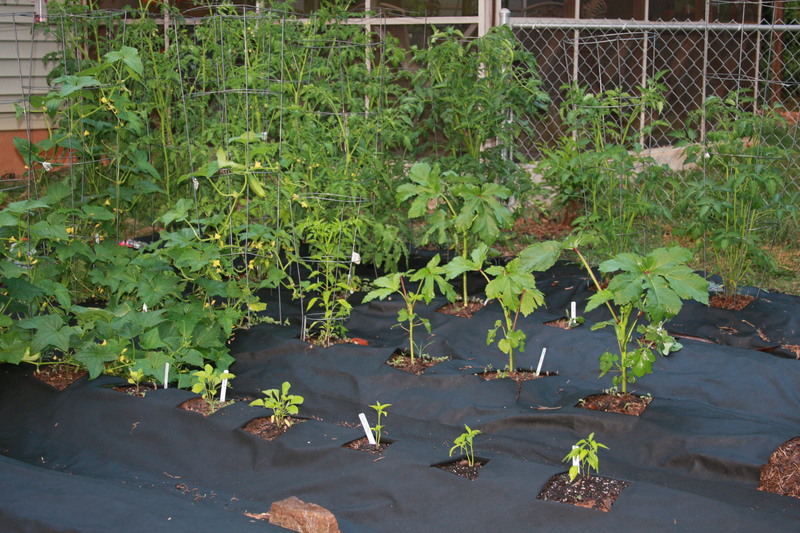 We also planted eggplant, collards, green peppers and chili peppers, and jalapeno, none of which are producing just yet, though these all seem to have really started growing better since the weather got hotter. Collards seem to grow great here, but they must be checked daily for little green worms that like to eat the leaves up. I really hate picking them off, but it is necessary… and on the bright side, I haven’t noticed them as much since it really started getting hot! In fact, since the latest heat wave, I swear our collards have doubled in size. My favorite ways to eat okra are fried or grilled! Cucumber and apples make the BEST fresh juice! Who knew! Cant wait to make and preserve tomato sauce for the rest of the year!! 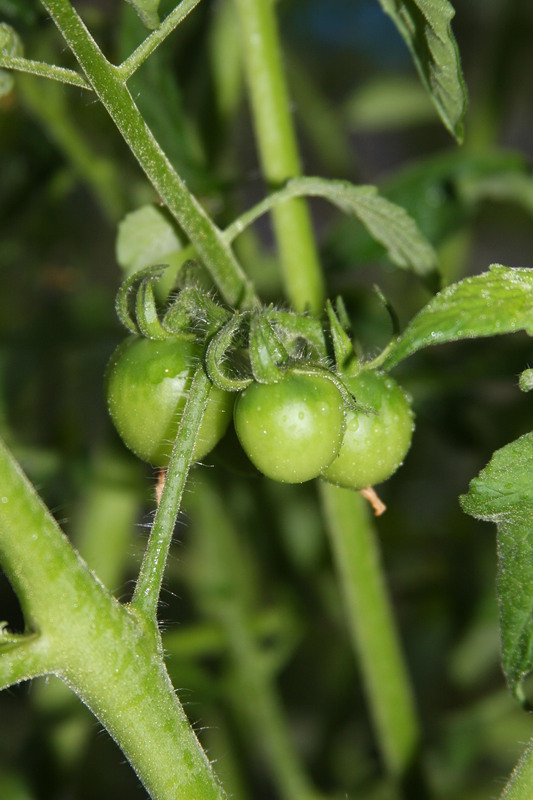 Our tomatoes are finally starting to get bigger but they are still pretty small and green. In fact, they have grown quite a lot since I took this picture (above) about 2 weeks ago! We also have had great luck with our herbs (cilantro, mint and basil) which all grow great with little effort, besides watering regularly. 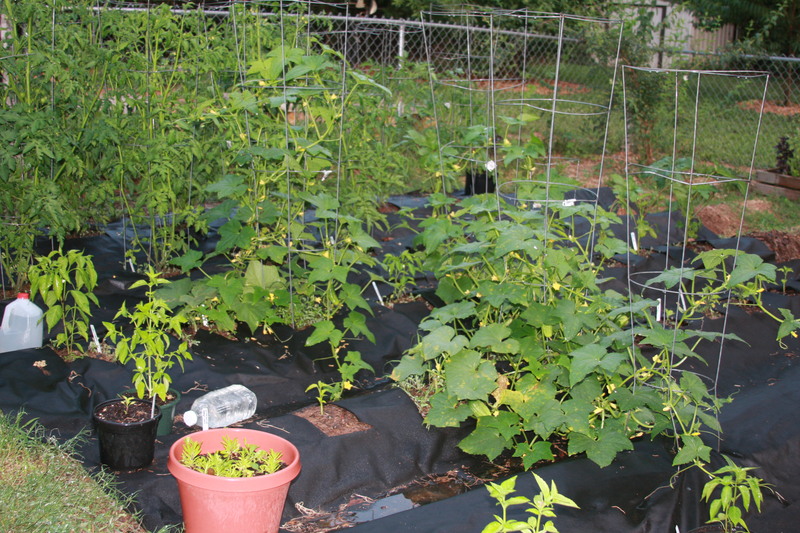 Here’s a good shot of the garden where you can see the weed guard… That’s the eggplants and green peppers in the front row, okra behind that and you cant really see the collards well behind those. We have been getting a bowl full of blueberries DAILY!! We have 3 bushes right now but I say we plant 3 more!! 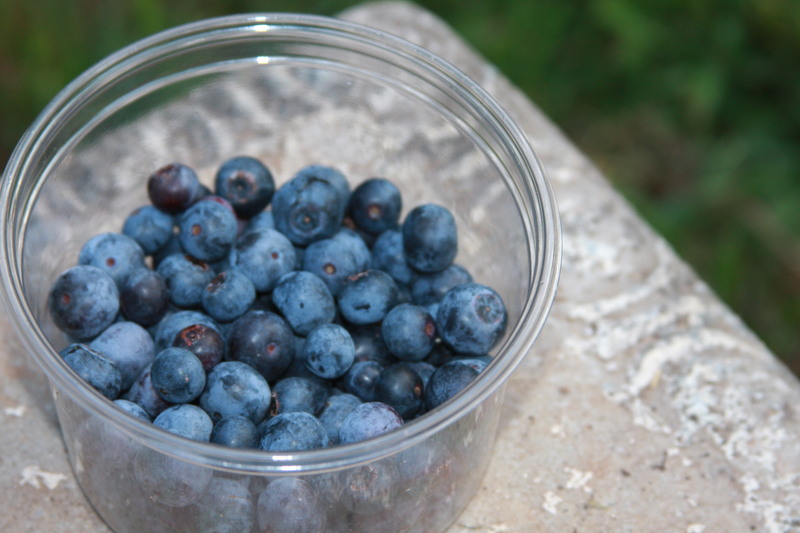 You can never have enough fresh organic blueberries! I’m trying to grow kale and cauliflower in containers just for the heck of it. These two plants aren’t supposed to grow well in hot weather, but I have them in pots under my front porch, so I guess I’m kinda just doing an experiment. The kale is actually lookin like its growing pretty good! Today is the 3rd day of temperatures over 100 (with a recording breaking 109 two days ago) so needless to say, we haven’t been doing much working in the garden (or even being outside) the past couple days. 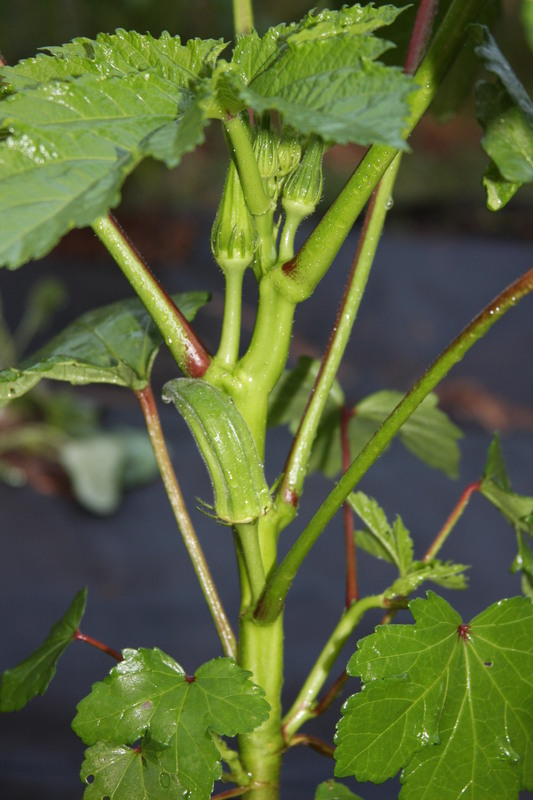 I gotta say… and I’m sure my garden agrees… I can’t wait for temperatures to cool down!